Product prices and availability are accurate as of 2019-04-19 06:56:10 UTC and are subject to change. Any price and availability information displayed on http://www.amazon.com/ at the time of purchase will apply to the purchase of this product. Casserole Carrier Bag - Portable Travel Casserole Tote - Perfect for picnics, BBQs, or transporting your favorite hot dish to a party, this versatile casserole tote from Camerons Products features a durable, insulated high-temp polyester interior liner with a cotton/poly blend exterior in black, suitable for any occasion. The top cover piece unzips all the way around, allowing for easy placement of your hot casserole dish inside, and has a velcro-closure pocket on the top for storing a utensils, seasonings, a kitchen towel, or oven mitt. The sturdy dual handles make for easy transport. 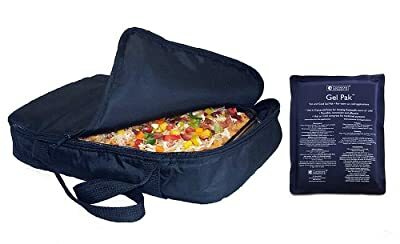 This casserole carrier easily holds up to a 11-inch by 17-inch baking dish and will keep food warm for up to an hour, and offers a convenient way to share your favorite recipe with friends. For best results, machine wash in cold water, remove and turn inside out to air dry.